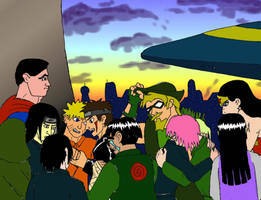 So here we have Naruto and Superman battling it out above Metropolis. 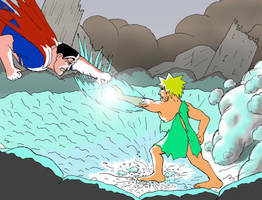 Naruto is still carrying Stargirl's rod here, because Superman hasn't knocked him down to earth yet. I liked this cover better, just because of the great view of Metropolis, and how well proportioned everyone was. But at the end of the day, the picture is TOO tidy... you just don't get the sense of action that's in the story. So I drew the new cover, which is less tidy but more action-packed. Yes, I see your point. The other cover has the sense of Knock-Down, Drag-Out Brawl. This looks more like a cover you's see a comic book logo behind. Looks epic, the sun in the background is a nice touch. "Could you please repeat that, Wonder Woman?" Mr. Terrific's voice was careful, polite. "I could have sworn you just said Batman suddenly decided to leave Gotham and told you to keep searching without him." Diana, from the bowels of her invisible plane, shrugged. "Well, I suppose theoretically Batgirl is keeping an eye on me from the Cave, but essentially, yes, that's what happened." this is Bats. This is GOTHAM. He barely lets anyone else in there, much less leave them in there without supervision." "I don't understand it either. He seemed in an awful hurry about something." "Really?" There was a slight pause. "He never contacted us about anything." Diana grimaced. "Of course he didn't. He said it was some 'personal business.'" After lying still for nearly half-an-hour in a fruitless attempt to commune with nature, Naruto concluded that something was wrong.